Greely PTO, in partnership with Foundation 51, is excited to announce the first Parent University session of the school year. Parent University offers free forums for parents to learn from expert speakers and each other about relevant topics affecting kids and families in an interactive, approachable atmosphere. 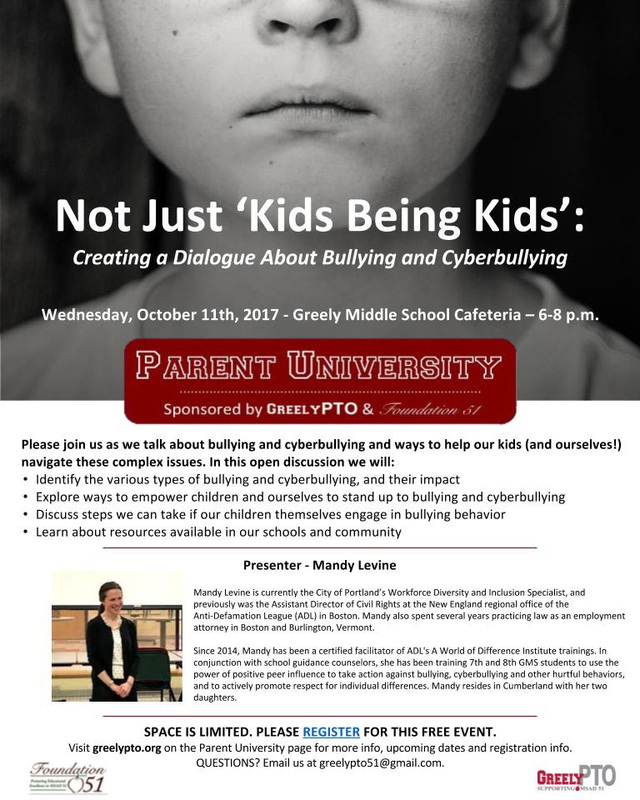 Please join us on Wednesday, October 11th at Greely Middle School Cafeteria, 6-8pm, for Not Just 'Kids Being Kids: Creating a Dialogue about Bullying and Cyberbullying. In this interactive session led by Mandy Levine, certified facilitator of ADL's A World of Difference Institute, we'll discuss ways to help kids and ourselves navigate these complex issues. Space is limited. Please register for this free session or visit our website for information about our 2017 series. Individuals who register by or before Thursday, October 5th will receive a complimentary copy of the MSAD-51 Bullying Resource Guide at the session. This guide was created by Greely PTO last spring, in partnership with school counselors K-12. It provides a blueprint for parents about the resources and programs available to their kid(s) to prevent and manage bullying throughout their Greely school experience. Mark your calendar for our next Parent University session on October 19th, led by Dirk Van Curan, MSAD-51's Directory of Technology, where we'll discuss Digital Citizenship: Parental Controls and Online Safety.